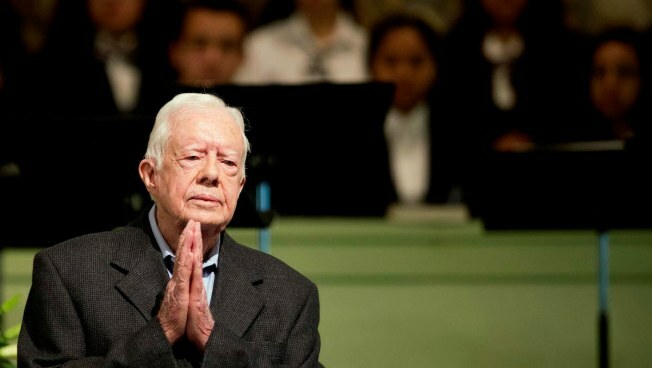 In this file photo, former President Jimmy Carter teaches Sunday School class at Maranatha Baptist Church in his hometown Sunday, Aug. 23, 2015, in Plains, Ga.
Jimmy Carter's grandson has died, the former president said Sunday, NBC News reported. Carter, 91, made the announcement during his regular Sunday school lecture in Plains, Ga., although he apologized for being late — the first time ever — and described how only a few hours before, relatives tried unsuccessfully to revive his grandson, Jeremy, with CPR. "When he got ready to eat supper he told his mother that he thought he would lie down awhile," Carter said. "His heart quit beating." The Atlanta-Journal Constitution reported that Jeremy was 28.